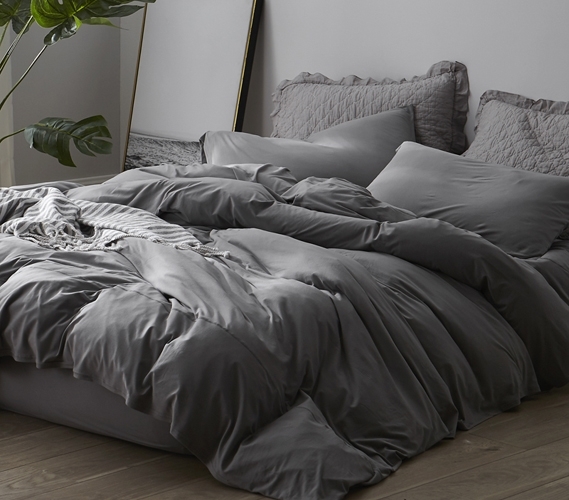 When we created our Bare Bottom Sheets, we took that freakishly soft jersey/yoga stretchy pant fabric and turned it into all-over Twin XL bedding. But we don't want you to have to totally put away your yoga pants when the depths of winter rolls in. Introducing our Bare Bottom Winter Warmth: a thicker yoga pant-like fabric that's designed to make you fall in love with it's ridiculous softness and comfort. After all, when Bare Bottom XL Twin sheets are the best college bedding you own, why should you put them away during the coldest part of the year? Our college dorm extra long Twin Bare Bottom Winter Warmth sheet set is perfect for curling up in and watching the snow fall, for having friends join you over for movie nights, or just walking around cape-style when you go a little insane over your insanely soft college dorm XL Twin sheets. Finally, guys can understand the obsession girls have with yoga pants and ladies don't have to give up the extreme comfort of jersey/athletic ware when winter comes. Our must-have XL Twin sheet set is the perfect gift for college students or addition to your dorm bedding!